The Cambridge Business in Africa Conference is less than a month away, and I thought it would be a good time to reflect on our journey so far. This annual conference is organised by MBA students who have a passion for Africa at Cambridge Judge Business School. This is the 8th consecutive year that the conference is being held at CJBS, and I am honoured to be a part of the team responsible for organising it. 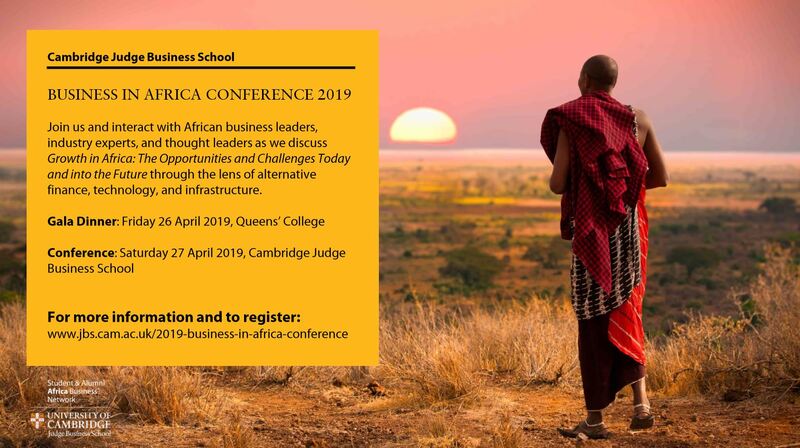 This conference is one of the largest annual conferences held at CJBS and attracts business leaders, students and professionals with an interest in business in Africa as well as other emerging markets. I have had the pleasure to work alongside my MBA class mates Thabo Lenneiye and Steeve Tchatchuing, as well as with Rivha Kamara from the MFin programme in planning this event over the last five months. To say that the planning process has been challenging would be an understatement! From securing venues for the conference and gala dinner, to sourcing quality speakers, to seeking sponsors, we have faced all kinds of challenges. However, the strength and dedication of our team has allowed us to find ways around these challenges and keep things moving forward. Coming into the MBA programme, I had the objective of enhancing my leadership skills and I thought that organising this conference would give me the perfect opportunity to challenge myself, get outside my comfort zone, learn from others, and practically apply my planning and organisation skills, with the goal of becoming a better leader. Born and raised in Nairobi, Kenya, I have a deep connection to Africa, which is the source of my passion for the continent. This conference provides us with the opportunity to help change the perspective that people have about Africa and showcase the exciting business opportunities that exist on the continent. It also provides a forum to have an open discussion about the challenges of doing business in emerging markets. Our speakers are drawn from a variety of industries including alternative finance, infrastructure, technology, among others, and will provide interesting perspectives on how they have turned challenges into opportunities to build thriving businesses on the continent. The conference will also provide students and professionals that have an interest in emerging markets with a fantastic opportunity to network with like-minded people and interact directly with our speakers. We are looking forward to hosting a successful conference in a few weeks’ time, with the hope that the many months of hard work our team has put into planning this conference will provide a valuable experience for all attendees and will contribute towards broadening the perspective that people have about Africa, a continent full of opportunities.